Now available from Silvan Australia , the new Selecta 12 volt Oil Drum Pump Kit makes the transfer of bulk oil supplies from a drum into a small container or engine much easier. Selecta Spokesperson, Sophie McCarthy acknowledges that transferring oil between the bulk drum supply into either a smaller drum or as a direct fill or top up into a tractor, or other mobile equipment can be a challenge. “The Selecta Oil Drum Pump Kit enables clean easy transfer of oils, especially for in field service or maintenance,' says McCarthy. These 12 volt Oil Drum Pump Kits (Selecta Part No. F00268000) feature a 12 volt battery powered Viscomat gear pump, with a flow rate of 4.5 litres per minute, supplied with a 2m length of cable and alligator clips. The pump is designed to easily attach to the bulk drum supply with the quick drum 2" or 50mm quick connector, that enables hassle free installation and ready interchange between drums. The kit is supplied with a four metre length of 19mm oil delivery hose complete with a trigger lock hand piece dispenser and manual twist close non-drip nozzle. With a reinforced suction hose and filter attached to the pump, the oil pump drum kit is designed to suit a traditional 200 litre bulk oil drum. 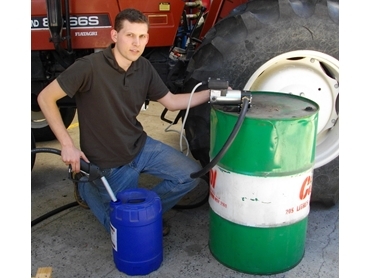 This kit, including the 12 volt Viscomat oil pump, can take its power source from the battery pack of the tractor or equipment, and with an all up weight of only 9kg it is easily portable.